KADOMATSU consist of 2 words, KADO and MATSU. KADO means gate, KADOMATSU are put at the entrance. 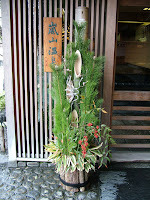 MATSU means pine, KADOMATSU are made pine, bamboo and others. The Japanese thought that God dwelled in KADOMATSU in old days.